Race Volunteers Make the World Go ’Round (and trail runners have the best manners)! After a long stretch in the darkness at Black Canyon 100K earlier this month, I was thrilled to see in the distance a tiny spark of light on the horizon. It would disappear and reappear many times as the trail I was on undulated along the contours of ravines and hillsides. Gradually, it grew and grew until ultimately that spark of light materialized into a brightly lit tent. When I arrived, I found it full of cheerful and helpful volunteers whose only goal right then was to take care of me: food? water? electrolytes? Yes please! Race volunteers are there before the race starts, marking the course, setting up aid stations, checking runners in, and—perhaps the most thankless job—directing traffic. They’re doing whatever’s needed so runners have a great experience, everything goes smoothly, nobody gets lost, and the race starts on time. Once the race has begun, they’re touching slobbered-on, sweated on, and just in general disgusting water battles, hydration packs, you name it. They’re offering cheer and support and concern. Many times they’re dressed in costumes and have taken the time to create personality for their particular aid station: beach theme? shark week? 80s nerd? pierogie heaven? There’s no end to the creativity! And when you stagger out of the woods or the dark and into one of these amazing havens, the race feels a little easier and spirits are higher. At Volcanic 50 on Mt. St. Helens, these volunteers not only staffed aid stations but in many cases also hiked in their supplies and decorations and signs and music. All so the racers could have an amazing experience. At Beacon Rock 50K, there was one aid station at the middle of a double figure eight loop—so it was just this group of guys, all day, helping everyone multiple times. I was wearing a running dress at that race, and after a while they got to know me and I still smile when I remember their whoops and their hollers of “Yay running dress!” as I’d come back through. Volunteers also stay long after the runners do. They tear down aid stations, clean up trash, sweep the course, and ultimately dismantle race HQ and the finish line. It doesn’t pay in money; it’s all just part of volunteering and the role volunteers play in making races awesome. Some race volunteers are locals who enjoy supporting the runners who come from all over to be a part of their community for a day, or a weekend, or longer. Others are friends or family members who have found a role for themselves as their loved ones take on the course. And others are runners who are giving back … it’s their chance to create cheer, to fill bottles, to make endless PBJs and cut up hundreds of bananas and oranges, to offer words of encouragement, to simply be there and make a difference. As a race volunteer, I’ve worn a knight costume, dressed up like a cowboy, and spent hours decked out as a shark while tracking runners on a 100-mile course through the night. I’ve been covered in trail markers that stuck to me as I swept on a 100-degree day. I’ve done trailside first aid on a dislocated shoulder. And I don’t think I can ever give back as much as I’ve been given when I’ve been the runner. But always, the best part of being a race volunteer is the thank yous and the smiles—because trail runners are the best and, while they may blow snot rockets and go to the bathroom in the woods, they always have the best manners. The Black Canyon Ultras—put on by Aravaipa Running, which also hosts the ultra party known as Javelina Jundred—offers 60K and 100K courses through the desert paralleling I-17 just north of Phoenix in Arizona. While it has a net elevation loss (total loss about 9,000 feet and total gain around 7,000 feet), much of the climbing is in the second half. In the past two years, the weather has been extreme—with heat afflicting runners in 2016 and cold, wind, and rain causing a course reroute and reportedly miserable conditions in 2017. This year was perfect, with a high around 70°F and mostly sunny skies all day. I was lucky to have Mike and the girls as my crew. They all got up at 5 a.m. to drive me to the race start and then spent the day driving around to meet me at the Bumblee Bee Ranch, Black Canyon City, and Table Mesa aid stations and, of course, at the finish. The run starts at Mayer High School with a lap around the track. Mike was there to see me off, the girls were sleeping in the car, and I was thinking about how weird it was to know absolutely nobody at a race. Then, about a third of the way around the track, I saw my friend, Gretchen (who was there to pace a friend of hers later in the day), and with a cheer and a hug I continued my very slow ultra-shuffle around the track. Slowest lap around a track ever! We were then off through a couple of local neighborhood streets and into the desert. There were some easy uphills on dirt roads and I appreciated everyone who immediately started walking them. It’s so hard to be patient and conservative at the beginning of a race, but group solidarity helped a lot. In short order we hit the official Black Canyon Trail trailhead; we’d remain on the trail for the remainder of the day. For a while we were out on what I’d describe as open plains, rolling gently, mostly on double track. Then, a quick turn, and the promised downhill kicked in with fun-to-run but almost always rocky singletrack. We’d occasionally pop back out onto dirt roads briefly, and then make another turn onto more singletrack. I remember the first aid station—Antelope Mesa—where my strategy (thank you, Heidi Flora) of keeping a flask prefilled with Tailwind powder in the back pocket of my pack made for a quick refill and transition back onto the trail, but oddly I don’t remember the next aid station at Hidden Treasure Mine at all. Regardless, as I neared Bumble Bee, I was excited to see my family and had mapped out what I wanted/needed in the transition. Bumble Bee might just be my favorite aid station from any race to date: it’s a ranch, and as you come in you see the windmill that is featured in the race logo, you cross a nice open lawn, and everyone’s hanging out in an open, covered picnic area. Meg was holding up a sign with my face (long story that I just don’t know if I could do justice to, so suffice to say I knew my friends back home were there with me in spirit as soon as I saw it), Mike helped me with my transition, I ate some potato chips and salted potatoes, and was ready to head back out. I did decide to change my shoes here since I was getting a worrisome hot spot on my right foot: I’ve had some problems finding the perfect shoes since my previous ones were redesigned and no longer fit, so I’ve been switching three different pairs around for each training run, trying to figure out a good system. Since I knew this might be an issue, I had brought backup pairs for Mike to have at the ready at each crew-accessible aid station. As I left Bumble Bee, I gave the man eating cows the evil eye, I think they rolled their eyes back at me in disgust, and that was that. Initially there was a bit of dirt road and then long stretches of exposed singletrack. Our first climb of the day was right out of Bumble Bee, and it seemed everyone around me was slowing down. I was fully down with that, as the day was now warm and, for me, feeling pretty hot. We passed through many fascinating areas here—I remember going through a longish burnt-out section, with cacti blackened and crumpled along the trail. There was a dike maybe 20 or 30 feet wide of bright white quartz in the middle of miles of dark rock. At first I couldn’t figure out what it was, it was so bright and out of place. And trail markers, rather than dangling from trees, were knee to maybe hip-height, and carefully tied to a cactus or some other cranky plant covered with sharp things. I spent some time wondering if they were actually tied on or whether the trail marking crew simply threw them at the bushes and they stuck. I decided to regroup at Soap Creek Aid Station since my stomach was feeling just a little bit off and I was feeling more than just a little bit hot. Most of my standard food wasn’t appealing, and my stash of stomach-soothing oyster crackers was waiting for me at Black Canyon City. I sat down in a chair and gnawed on some pretzels and drank, then took my phone out of airplane mode to text Mike and let him know I was slowing down and taking a break. My phone immediately starting dinging, and dinging, and dinging, as I was inundated with well wishes and cheer from friends back home—I cannot describe how uplifting it was to see those come in. I then filled the OR ActiveIce Ubertube (aka a special-fabric buff) Heidi had loaned me with ice. That ended up being a lifesaver! From there, the trail remained rocky. And then it got rockier. Seriously. There were a few rocks. As we neared Black Canyon City, I finally fully understood the name of the trail and area. Ahead the bluff was a solid black rock: the sun reflected off of it, and it was really quite pretty. Just past that bluff was a muddy river crossing. I really didn’t want to get my feet wet and resigned myself to it anyway as I watched others plod through, but a guy in a green shirt showed me a way across just downstream, and I kept my feet dry. (Thanks Green Shirt Guy!) By now, we also had made it down to saguaro country. I tried to get good photos of them, but mostly wanted to keep moving. The one time I did stop completely, a guy ran into the middle of my picture. Ergh. Finally, I hit the downhill to Black Canyon City. Downhill is always awesome! … except when you know it’s an out-and-back and you’re gonna have to turn around and go back up it. Coming into Black Canyon Aid Station. I’m behind Green Shirt Guy. Black Canyon Aid Station was a mental test. First, it marked the end of the 60K course, so there were all these runners eating pizza, drinking beer, and sharing “my race is done” trail stories, but I wasn’t done. I tried to take it as a power anthem: you’re not done because you’re totally badass and going the full distance. That didn’t really work—I just wanted to be done and join the party! Also, shortly before my arrival, Abby had biffed on rocks in the parking lot (have I mentioned yet that there were lots of rocks?) and skinned basically her entire right knee. Mike had taken her to the first aid tent and they’d done a nice job of cleaning her up and bandaging her, but there were still crocodile tears pouring out now and again. She told me she just wanted to go back to the hotel, and going back out on the course was a serious battle of personal commitment and mommy instinct—I wanted to take care of my baby! But back out I went. I was over halfway, and I was determined to finish! After leaving the aid station stocked with pretzels, vanilla gu, and oyster crackers, as well as extra water and Tailwind as the next aid station was nearly 9 miles ahead, I started climbing. I knew I had an immediate climb up what I had descended; what I didn’t know was that past the out and back there was a lot more climbing. I was a little worried about pushing hard on the climbs and not having enough for the finish, so another woman and I buddied up for the next hour or so. Chatting with someone else helped pass the time and it was fun to share stories of her trail adventures near her hometown of Calgary and talk about our favorite races. Once the climbing was done I kicked into running again. But, oy! the rocks! My feet were pretty unhappy, and my fear of stumbling grew as my legs tired. I had seen many people with scrapes from falling on rocks throughout the day (and Mike said he saw several people at the Black Canyon first aid station getting cactus pulled out—ouch!) and I really really didn’t want to become another statistic. So, power walking to the beat of tunes provided by my bootcamp coach when it was rocky or uphill, and shuffle running through a growing blister and aching feet when it wasn’t—that became the name of the game. The sun set and headlamps came out, making the rocks appear even more treacherous. But the sun setting brought the gift of colors in the sky, and the darkness brought out stars that were huge in the deep dark of the desert and a sliver of a crescent moon that took forever to set on the western horizon. I think my favorite thing running through this part of trail in the dark was the forests of saguaro cacti, silhouetted by the sky and sometimes illuminated in the beam of my headlamp. For a time I was running alone, and then I briefly joined another group of runners. One woman and I speculated on how much farther that next aid station would be—this would be a very long nearly 9 miles for many of us!—she was out of water and despite stocking up for this section I was running low. Here we heard what we thought were people cheering and we got excited thinking the aid station would be just around the next bend, but no, it was a pack of coyotes howling. Dammit! But, finally we saw it, and we were all so happy. Meg’s there to greet me as I come in to Table Mesa Aid Station. I don’t think I’ve seen her yet and I clearly am pretty beat at this point. I now had a 7.7-mile section to Doe Spring, and then a 3.6 mile final section to the finish line. Oddly, I had passed a few people between the top of the climb out of Black Canyon and before Table Mesa, and again I passed some folks. It was like a snail race! Once again coyotes serenaded from the surrounding hillsides. The crescent moon glowed red as it finally made its final descent beyond the horizon. Crickets chirped. I peed somewhere off the trail again. And then there was rustling in a big bush of some sort right beside the trail. My first thought? Oh my gawd, it’s a javelina! Now, seriously, I have no idea why that was my first thought, but it was. I quickly turned my head, and there was a cow munching on that bush. I laughed at myself, and enjoyed the rush of positive energy that came from laughter. I’m such a dork! I ran with the guy from Wisconsin for much of this final section, and he commented that it looked like I was going to get my sub-17 after all. I was pleased, but more than anything I was happy that I was going to finish this crazy endeavor I had set out on. I was creating new curse words for every rock I encountered in the trail (owie owie owie), but outside of that I took time to look up in the sky and marvel over the brilliance of the stars, and I shined my light up and down saguaros that caught my attention. It was miserable and mystical and exhilarating at the same time. At Doe Spring aid station, I inhaled a cup of ramen and broth—briefly stopping to eject a moth that flew into my cup—and then set out for my final 3.6 miles. At first the trail was a relatively smooth dirt road: could it be that I was done with rocks and could run it in to the finish?! Dammit, no, the trail once again cut off onto a final section of single track and I was back to powerwalking and trying to avoid kicking rocks. But now there were more smooth sections, and Wisconsin guy and I could hear a generator in the distance. Could that be it?! Are those cheers or more coyotes?! Finally, it was real: there was the finish! In the last 50 yards, Wisconsin and I passed two more guys, and then I stopped just before the finish line to call for Meg, and they passed me as I waited for her and I lost two places (oh well! ), and then Meg and I ran across the finish line together. Mike gave me a huge hug, Abby gave me a huge hug, someone gave me my finisher’s belt buckle, a photo was taken, and then I fell apart. It was a happy and relieved and exhausted kind of falling apart though! My brother said the funniest thing to me yesterday, as he watched me struggle to walk into a restaurant at the hotel we’re staying at. 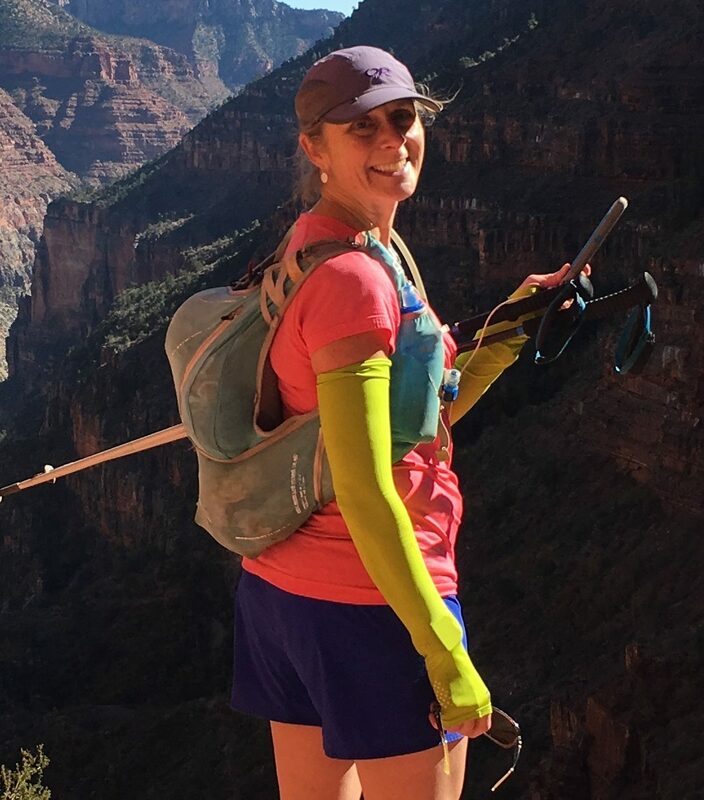 He said, “It’s amazing that you’re in such good shape that you can hurt yourself so badly.” It’s one of those oxymoronic statements that capture ultra running so perfectly. This run hurt a lot: but it also gave a lot. We get to run in beautiful places, and because we go far, we get to see a lot in a shorter period of time. I went through several microclimates, saw different flora (no fauna except the cow), and saw incredible rock formations. I was able to prove to myself that I could turn my experiences, especially last year’s struggles, into lessons learned that allowed me to perform better and do something harder than I’d done before. When I couldn’t find my inner bunny last fall, I was worried—but I think I found a stronger bunny (or am I carrying this whole bunny thing too far?). I definitely found a stronger me through this journey. And best of all, I got to share it with my family. Training for ultras often means long periods away from them. I feel selfish sometimes, pursuing a sport that takes me away on weekends, something that I rarely share with them directly. To have Mike and the girls there, and seeing their joy for me, simply amplified my personal joy and made it a deeper and more meaningful experience. Bridle Trails Winter Running Festival 50K … or, How Did I Get So Lucky? Yesterday I ponied up to a starting line for the first time since my DNF at White River 50 last summer. I’ve had some wonderful runs on gorgeous trails since that DNF—including a weekend in the Olympics, the UltraPedestrian Owyhigh Loop, and of course R2R2R—but still feeling the sting of that DNF, doing a race (!!) felt intimidating. Bridle Trails is kind of a winter lark. The 50K is six loops of a 5-ish mile course, and there are options for a 5 miler, 10 miler, and 50K relay too. And, it starts at 3 p.m., so if you’re doing anything longer than 10 miles, you’re pretty much guaranteed some time chasing the beam of your headlamp through the woods. I signed up a few weeks ago, as it fit well into my training plan. I’ve done a few long runs on my own lately, and podcasts—while nice distractions—cannot replace the camaraderie of running with other people. This would be an easier way to get in those miles. I started the day with a fun late holiday party with some wonderful friends I’ve met through road running. Every year we set aside a Saturday morning for a quick run or walk followed by a potluck of all sorts of yumminess, and then we have a crazy, out-of-control gift exchange. We all randomly get a gift, share what’s in our package, and then pass two pairs of dice (in opposite directions) around the circle. If you get doubles, you have to exchange your gift for someone else’s—even if you don’t want to. For 5 minutes, it’s hilarious mayhem! After the party, I headed home and started getting my gear together for the 50K. So this starting at 3 p.m. introduced all sorts of weird challenges: when should I eat? What should I eat? When should I eat what? With my gear finally organized, it was off to a local school to cheer one of my daughters as she played basketball. Her team was short players this week, so she played the entire game. It was like she did her own version of an ultra. I then headed to Bridle Trails State Park. I was there about 1:30, which meant 90 minutes of sitting around in my car worrying. I knew Rich would be there, but wasn’t expecting to see anyone else. I texted Wendy and shared how nervous I was. She replied, “Well, I signed up for the 10-miler at the last minute. I’ll run the first two laps with you.” Shazam! I was so happy! Little did I know that that was only the first surprise of the night. Lap 1 was the typical jockeying for a place on the trail until folks got spread out. Wendy reminded me to watch my pace (I’m known for going out a bit too fast) and had fun trying to run in the muddy parts to squish down mud lumps. Rich was out on the course ringing a crazy loud and obnoxious cowbell, which was fun to hear and made me smile. As we set out on lap 2, he joined us for a mile or so until we hit a trail that cut out to the street—that was his turnoff to head home, so he waved goodbye and Wendy and I continued on. Wendy kept me company for the rest of the lap, and we had a good time chitchatting and passing the time. As I finished our second lap, I starting thinking about what it would take mentally to run four more laps on my own. As we headed over to where the drop bags were for me to restock on food, there was Sarah … ready to run! That stinker! Such a surprise! Sarah, who’s just back running after a knee injury suffered during our R2R2R, chattered away and made lap 3 a breeze. Sarah was only up for one lap, and I was back to thinking about three more laps on my own …. this lap after lap thing is mentally tough! As I start to head out for lap 5, I turned around and got surprise no. 3: there was Ana, grinning from ear to ear, and holding out a Pepsi and a package of Oreos. Another stinker!! It was amazing, and by now I was feeling in the love of my friends and their support. I can’t tell you how much I appreciated them! I said farewell to Ana, but was quickly shortstopped by Christy and Sharon, along with Sadie Blue (Sharon’s dog). I was starting to figure out that my friends had been making plans behind my back! Loop 5 felt a bit longer. By this time I knew the trail well—where the mud pits were, where the hills were, turn left, turn right, over the fallen tree there, almost back!, down the hill, yay! another lap done. As I came back in, I was thrilled to see Christy, Ana, and Sharon still there. Christy and Sharon were decked out in strings of Christmas lights—I cannot tell you what a happy sight that was!! As I took an Oreo from Ana and Christy handed me a little Halloween-candy-sized package of Sour Patch Kids, Sadie Blue licked the sweat from my legs (ewwww! ), and then we exchanged hugs all around and they headed home while I headed out for that last lap. Lap 6, not surprisingly, was a bit of a chore. Same hills, same flats, same mud pits. Maybe I found myself mentally whiny, but I focused on my mantra (which was now, “You are strong! You’re gonna finish this mother f’er!”) and felt my focus return. I found myself cheering on some runners I passed, sharing “woot woots!” and encouraging one guy who was walking that he was gonna get it done. I finished in 6:17ish—my fastest 50K on my least-hilly and least-technical course. And, as I drove home, all I could think was, “How did I get so lucky?” I have this crazy supportive and wonderful husband who lets me take the time to train, I have these silly and spontaneous daughters who are proud of me despite complaining about my training time, and my friends? Seriously, they’re awesome. Wendy Abbey, Rich Bennett, Sarah Brouwer, Ana Hinz, Christy Cherrier, Sharon Hendricks, Sadie Blue, all the Running Lattes, Mike Maude, Abby Maude, and Meg Maude. And afterward I learned of more people who wanted to cheer me on but couldn’t, including Elly Searle, Callista Salazar, Heidi Flora, Kelly Woznicki, and Nina Hadley. You guys rock! I love you all. And, I think I’m ready for that next one. I will dedicate miles to each of you! And to Seattle Running Club and Northwest Trail Runs—thanks for a great event! My horse-loving daughter has absconded with my finisher’s horseshoe. And I had a blast.